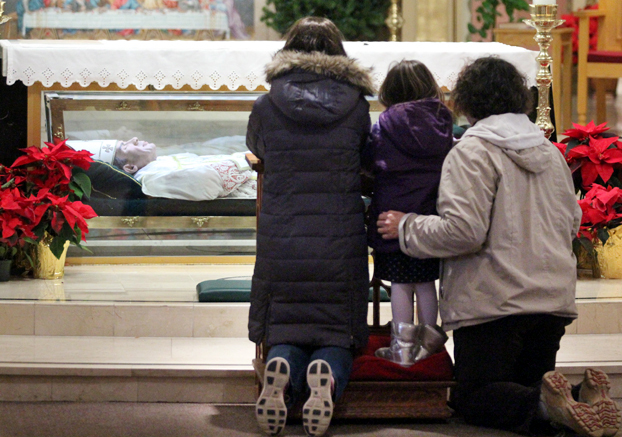 Worshipers pray at the tomb of St. John Neumann. 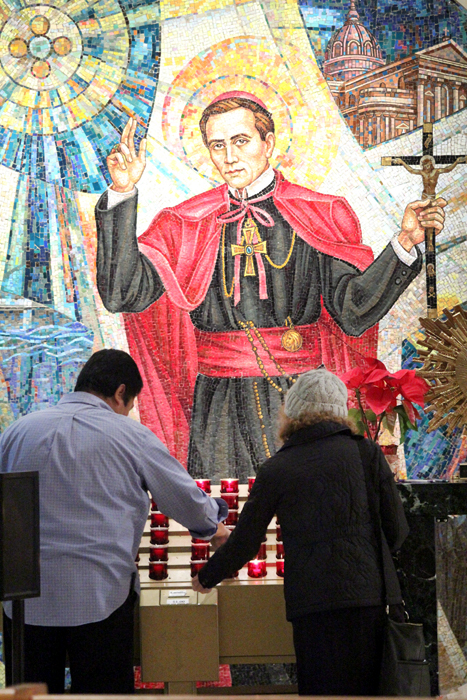 Worshipers light a votive candle before a mosaic of the saint at St. Peter’s. 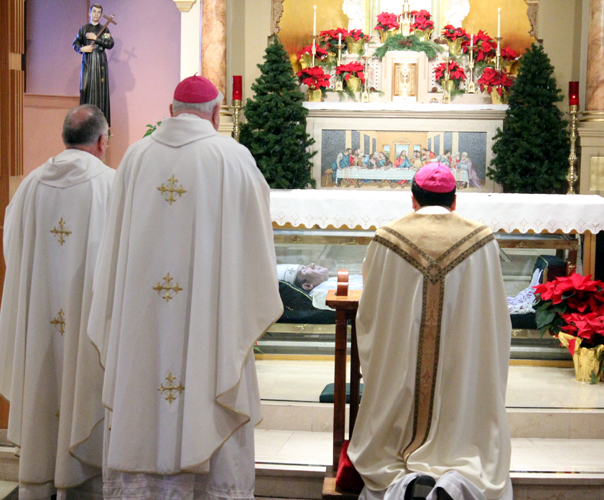 Praying at St. John’s tomb are, from left, Redemptorist Father Kevin Moley, Archbishop Edward Gilbert and Bishop John McIntyre. 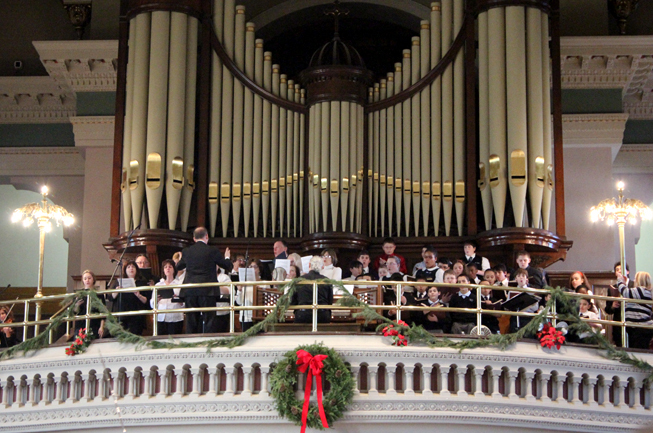 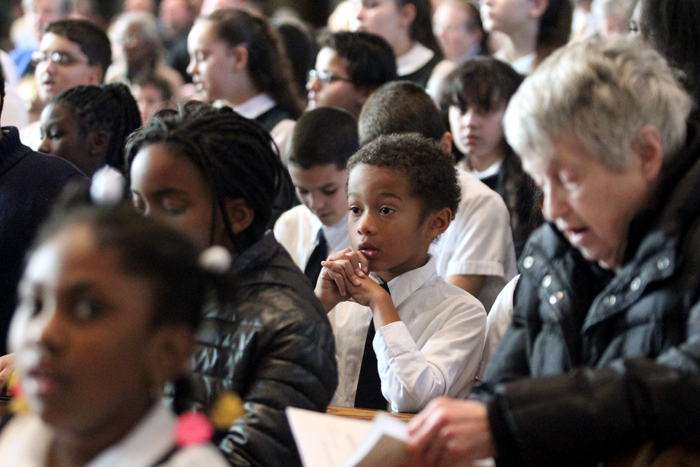 The combined choirs of St. Nicholas of Tolentine and and St. Peter the Apostle sing during the Mass. 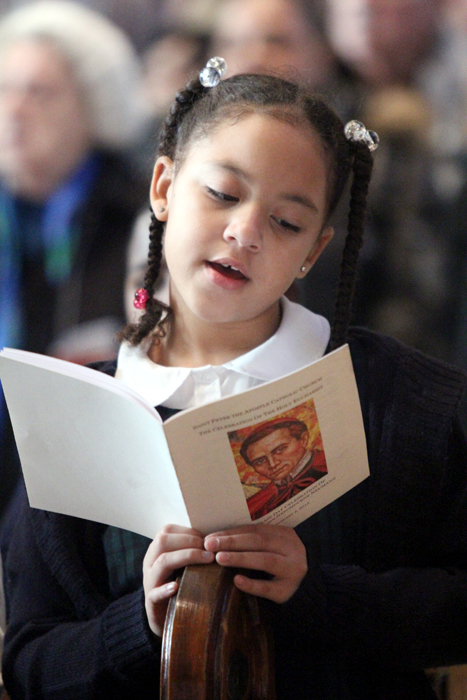 Second grader Nadia Russell of St. Peter School sings a hymn during Mass. 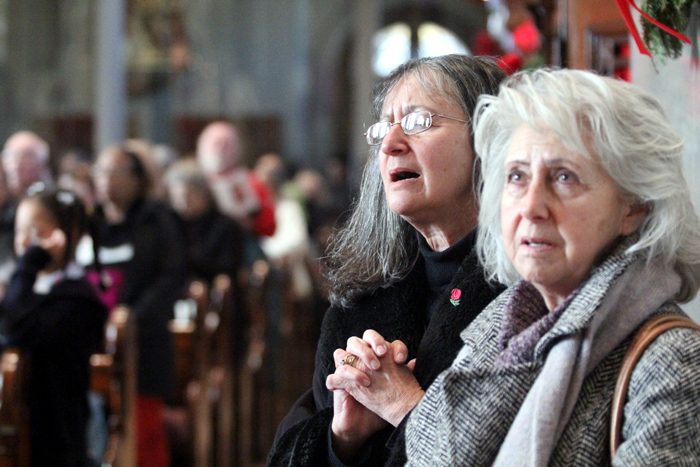 Kathleen Evangelista, left, and Dolores Zambito participate in the Mass. 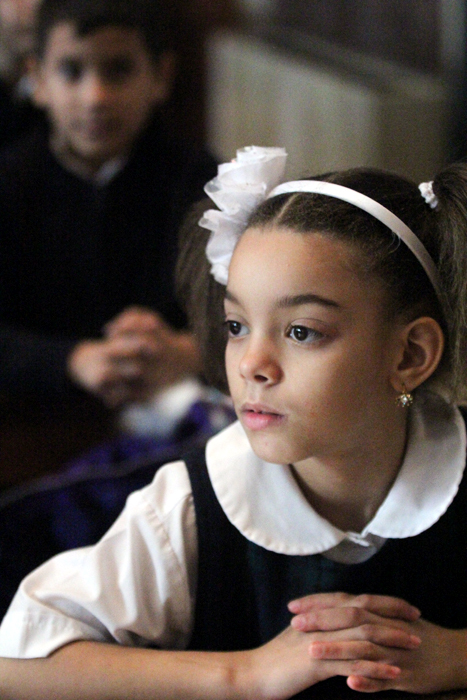 Mia Espinoza rests in the arms of her father Rodolfo. 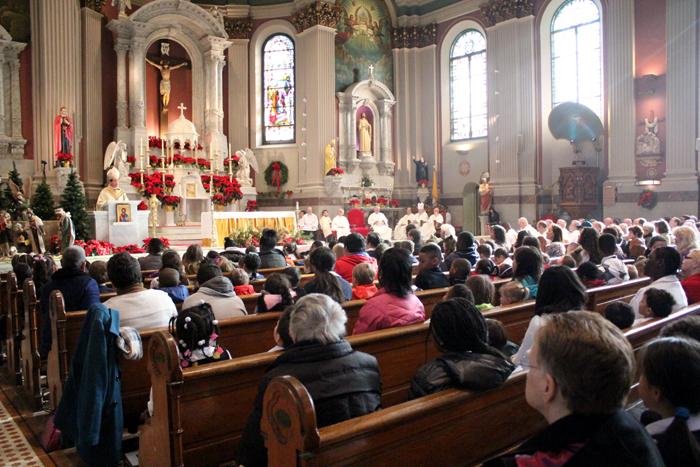 Bishop McIntyre preaches the homily at St. Peter the Apostle Church, located at Fifth Street and Girard Avenue in Philadelphia. 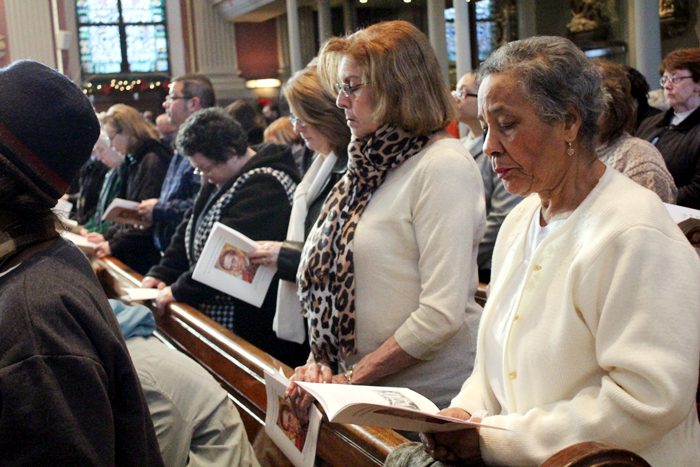 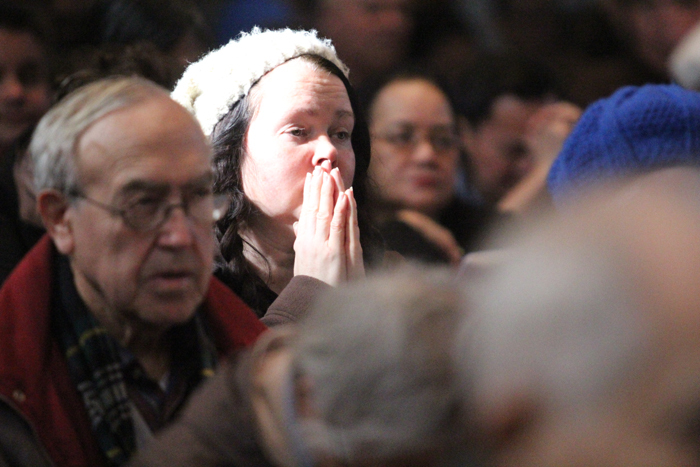 Hipolita Vega, right, prays at the Mass using her worship aid booklet. 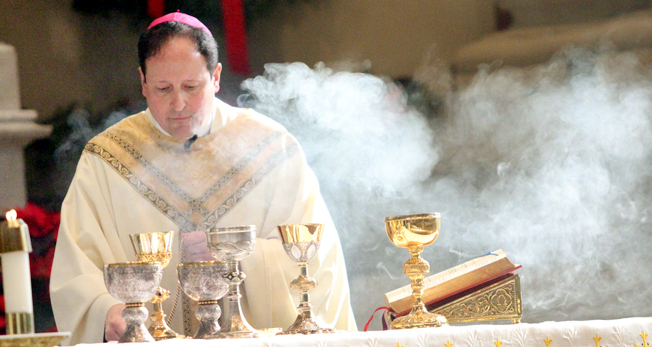 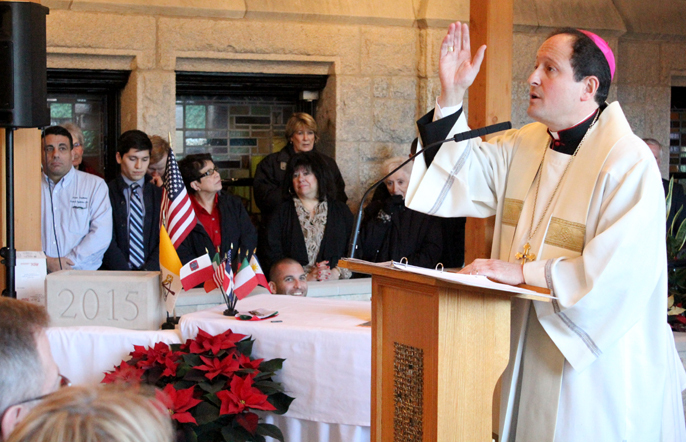 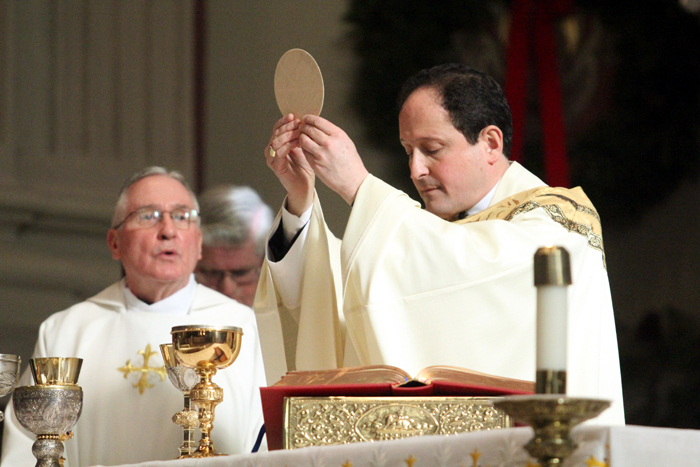 Bishop McIntyre incenses the altar during the Liturgy of the Eucharist. 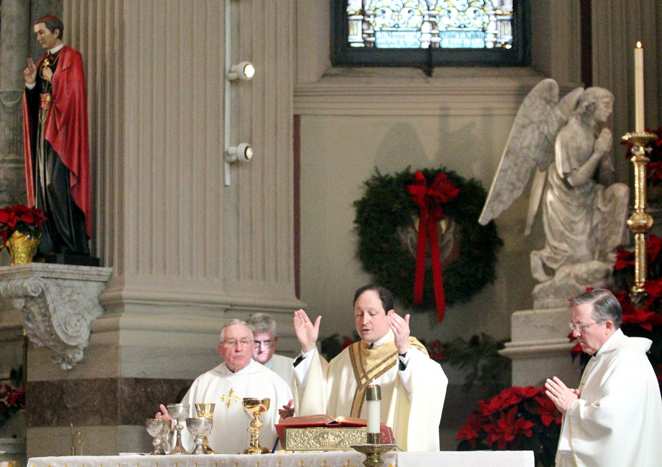 Redemptorist Father Kevin Moley (left) and Redemptorist Father Alfred Bradley (right), who is pastor of St. Peter Parish, concelebrate the Mass with Bishop McIntyre. 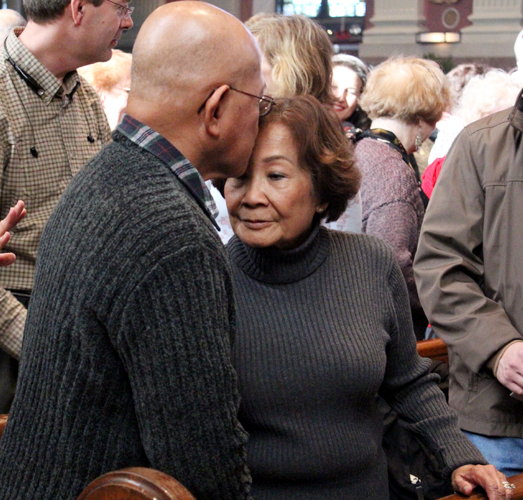 Neapoleon Armenio kisses his wife Leonor on the forehead as a sign of peace. 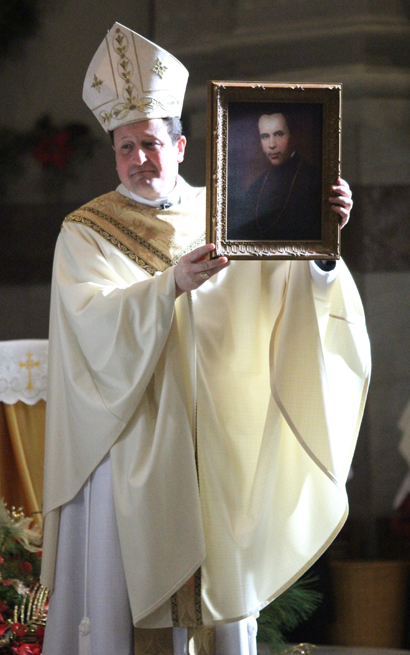 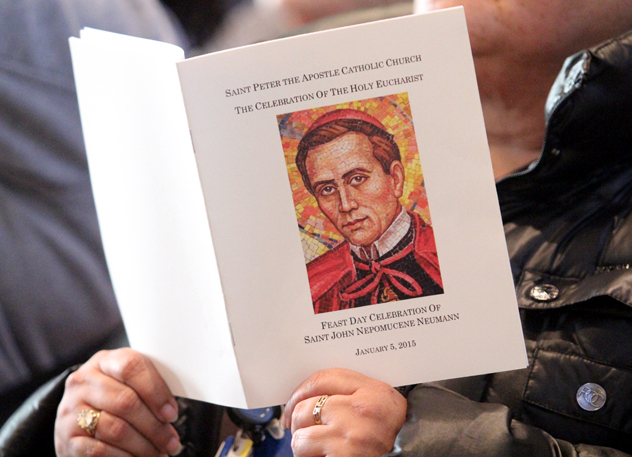 Bishop McIntyre holds a portrait of St. John Neumann. 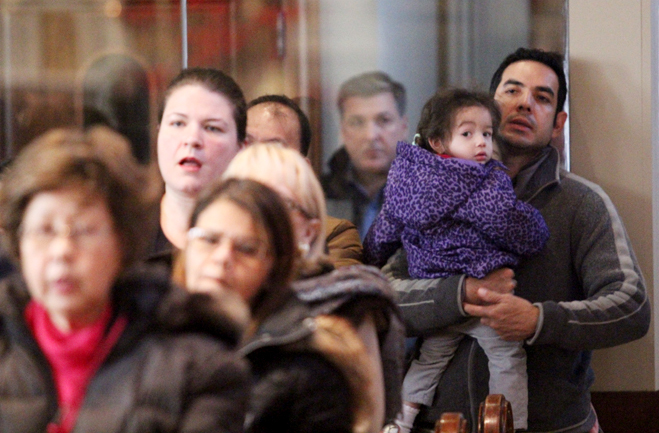 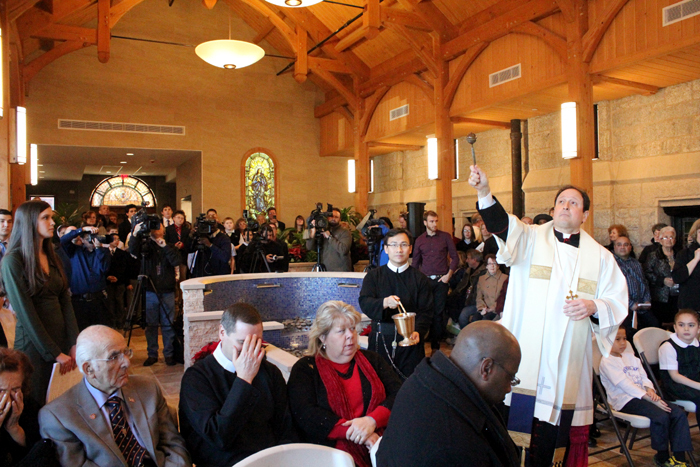 People gather for the blessing of the new atrium at St. Peter’s. 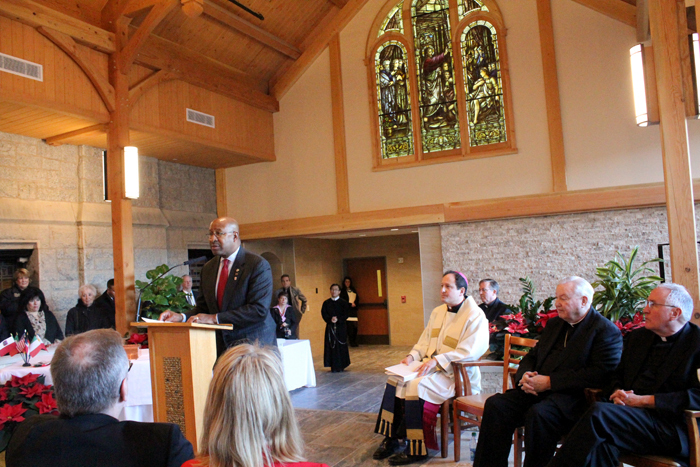 Bishop John McIntyre reads a prayer and blesses the atrium. 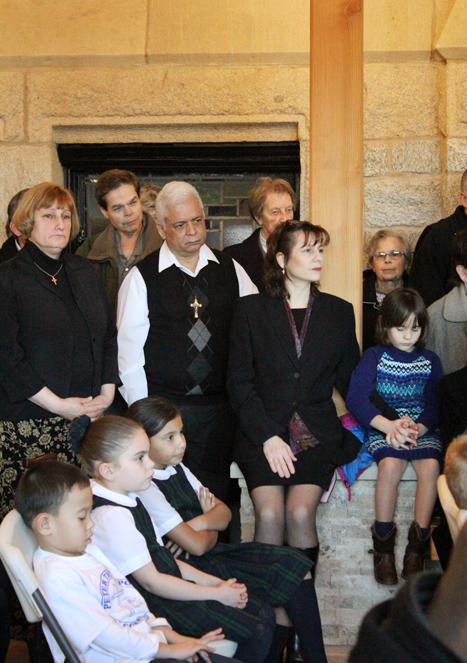 Bishop John McIntyre sprinkles holy water to bless the new atrium and everyone in it. 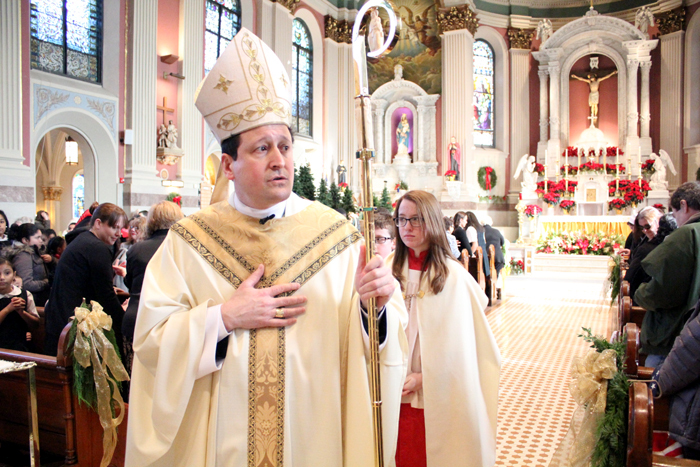 Philadelphia Mayor Michael Nutter speaks during the blessing ceremony about St. John Neumann, the World Meeting of Families and the coming visit to Philadelphia by Pope Francis.